According to the Apostle Paul, the creation will at some future point be passively liberated from its slavery to change (phthora – Romans 8:21). What did he mean by phthora? Plato used the phrase “genesis ka phthora” for the process that continues to corrupt everything since the beginning. Aristotle used the word phthora for when a city changed its constitution: that is fundamental change. In this text the phthora change is in the direction of ruin. Origen, in his commentary on Romans, understood Paul to refer to qualitative changes in all things, including the Sun and stars. Paul began this section by stating that we know (eidon): to perceive with the eyes, to notice, to look at. Evidently Paul was not the only one to see these things since he says we know. In Paul’s days, even the pagan philosophers acknowledged that everything changes. The only thing that Plato could imagine that was not changing was an undetectable parallel universe, the form of things. Aristotle acknowledged that everything corrupts but he imagined that hypokeimenon (what is under) suffers no change. Claudius Ptolemy wrote that all things without exception are changing. He thought that mathematics was reliable because when things change, mathematics tracks with the changing things. He claimed that physics was like guesswork because the nature of things is unstable. Evidently no one in the biblical age could imagine that matter is unchanging. Paul used the word gar three times in the passage Romans 8:19, 20 & 21. Gar is a particle that can mean truly, especially the causal reason for something. He used the compound verb hupotasso twice. Hupo means under and tasso to appoint, arrange, to order. Polybius used hupotasso for troops arranged in order under the commands of their general. The first hupotasso verb is aorist passive. The creation did not originate its orderly corruption. The curse of the animals and the ground in Genesis is also passive. God did not create thorns and thistles, they came about by means of the passive curse. The second hupotasso verb is an aorist active participle. The creation actively and in an orderly manner carries out the command to become futile, to inutility and transitoriness. In verse 21 Paul explained that at some future point the creation will be liberated from its slavery to phthora. Then in verse 22 he explained that the whole creation groans together [sustenazo] and pains together [sunodino]. Groaning together was the common experience of the citizens of a city that fell to the Roman army. Everyone in the city experienced the horror of the army’s payday at their expense, so they groaned together. Sunodino means to travail together and was used for the together pains of childbirth when many muscles contract together and in sequence. 1. We know (everyone in that era knew) that the creation is corrupting itself. 2. The changes in creation began at an unspecified point (the curse?) and are continuous until now. 3. The changes in creation are orderly – in obedience to God’s command. 4. The things that are changing are not just local, since they extend to the whole creation. 5. The changes in creation are not for the better, since they are in the direction of inutility. 6. The changes in creation are together changes. Things that change together in an orderly manner, change relationally. Relational change is where nothing is independent or unchanging, but all things change together, in parallel. Now let’s examine the Second Law interpretation to see if it fits the text. 1. No one during Paul’s days knew anything about the Second Law. 2. The Second Law is not about orderly processes. It expects orderly things to become disorderly by random processes. 3. The second law is not applied to the whole creation. The internal processes in all atoms are excluded from the Second Law. Scientists assume that atoms are perpetual motion engines since they define their measuring units using atomic clocks that allegedly are always clocking the same frequencies. Most scientific definitions, measuring units, methods and mathematical formulas presume that atoms remain the same, since scientific empiricism depends on that assumption. 4. The Second Law is not about relational changes, things that change fundamentally and in parallel. What if Paul had a vision of the future predicting the Second Law of Thermodynamics? He should have written, someday people will know through mathematical reasoning that the things that began to receive form when God continued to command light to continue to be, groan and suffer the pains of childbirth together until now. The double emphasis on orderly change and togetherness suggest that Origen was closer to Paul’s intended meaning than creation scientists. Today we can see with telescopes in billions of galaxies that all atoms are changing relationally and have been doing so for vast ages. The earliest atomic clocks we have analyzed to date clocked less than 1/10th the frequencies of modern atoms. The changes in the light from all atoms must have been orderly since modern atoms still function in an orderly manner. Paul never suggests that we fight with philosophy (that is science). He says the weapons of our warfare are divinely powerful for the destruction of fortresses. We are destroying speculations and every lofty thing raised up against the knowledge of God and we are taking every thought captive to the obedience of Christ and we are ready to punish all disobedience, whenever your obedience is complete. (2 Corinthians 10:3 – 6). Someday, when our obedience is complete, we will use the word of God to bring down science itself. What glory the Creator will get when he makes foolish the wisdom of this age, as He promised. 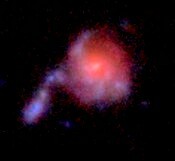 Look at galactic history and you will see the simple answer to the age of the universe puzzle. The stars continued to come out and spread out as galaxies grew into huge, local growth spirals as every atom has changed in an orderly manner. The inertial orbits, the atomic clocks and the space matter takes up all changed relationally, together. The only history that is visible as it happened is galactic history and what is visible exactly fits the literal, biblical text both for creation and cosmic history. This is galaxy number HUDF 4491 from NASA’s Hubble Ultra Deep Field. Notice the distinct separate globs (evidently packed with close together stars) emerging from the redder core. Evidently this is a spiral arm just beginning to form and emerge. The light from this ancient galaxy shines at less than 50% of the frequencies of modern atoms.